Note/Disclaimer: This post contains loading data believed to be safe in my guns. It may not be safe in yours. Do your own research before you try this. I'm not responsible if you get hurt or your gun gets damaged. 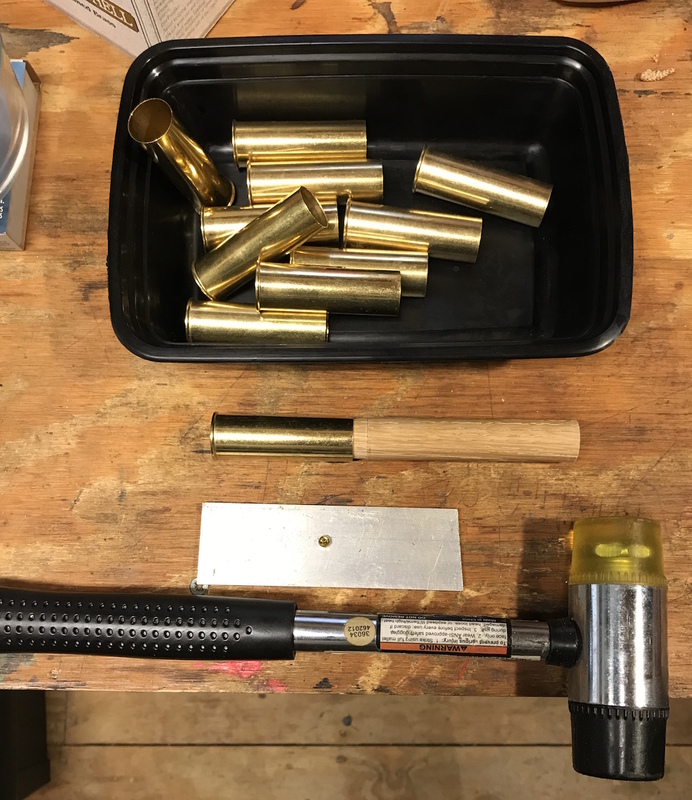 A couple of weeks ago on Survival Russia, Lars posted a video about loading brass 16 gauge cases using minimal tools. He followed up with a second video in which he shot his reload and got what I considered pretty good results. 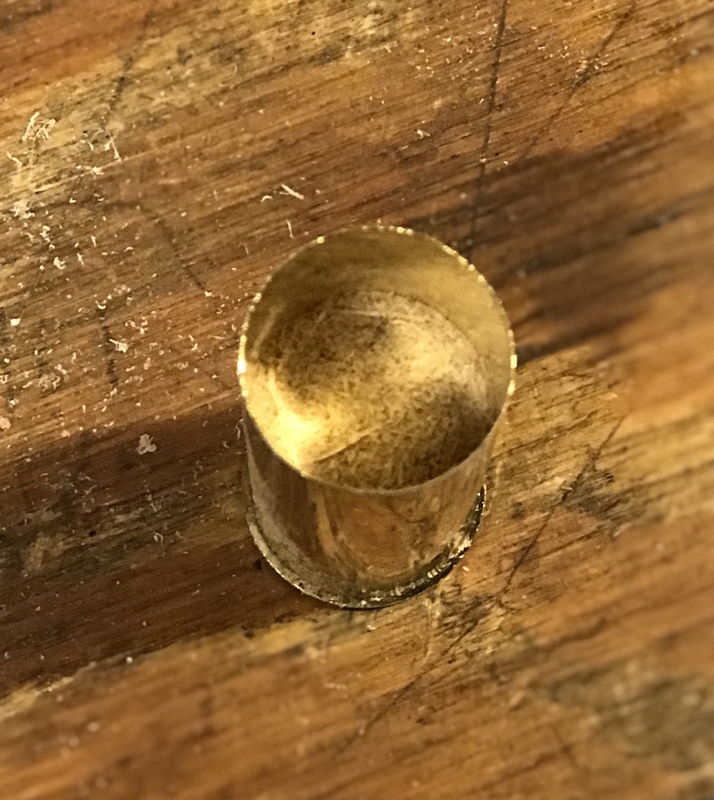 In the past I have experimented with hot glue slugs* using minimal tools, and as I've posted about before, I have muzzleloading smoothbores. 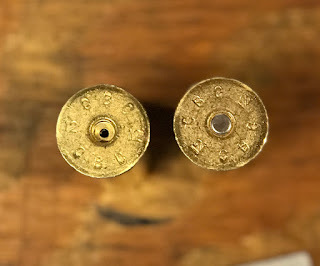 I also have a few break open shotguns that I've been wanting to try black powder loads in, since I have a good stock of black powder and you can reload brass cases with minimal tools that you can make at home. A 500 count bag of 10 gauge over shot cards. Magtech brass cases have a larger internal diameter than the equivalent gauge plastic hulls, so they recommend using 11 gauge nitro cards and fiber cushion wads, and 10 gauge over shot cards. I use home made cards and felt wads in my 12 gauge Euroarms Magnum Cape Gun, cut with a 3/4" punch, which is about 11 gauge. So, I decided to save a few bucks and use these in the brass cases. As it turned out, I would have gotten a better fit with 10 gauge components all around. 1 oz. #7.5 shot using sawdust in lieu of a fiber cushion wad (a la the Survival Russia video). 1-1/8 oz. #7.5 shot using a sawdust "wad." 1-1/8 oz. 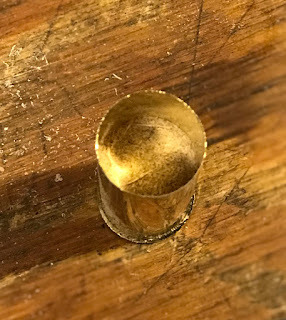 #7.5 shot using the same 1/8" thick lubricated felt wad that I use in my 12 gauge muzzleloader.1-1/4 oz. 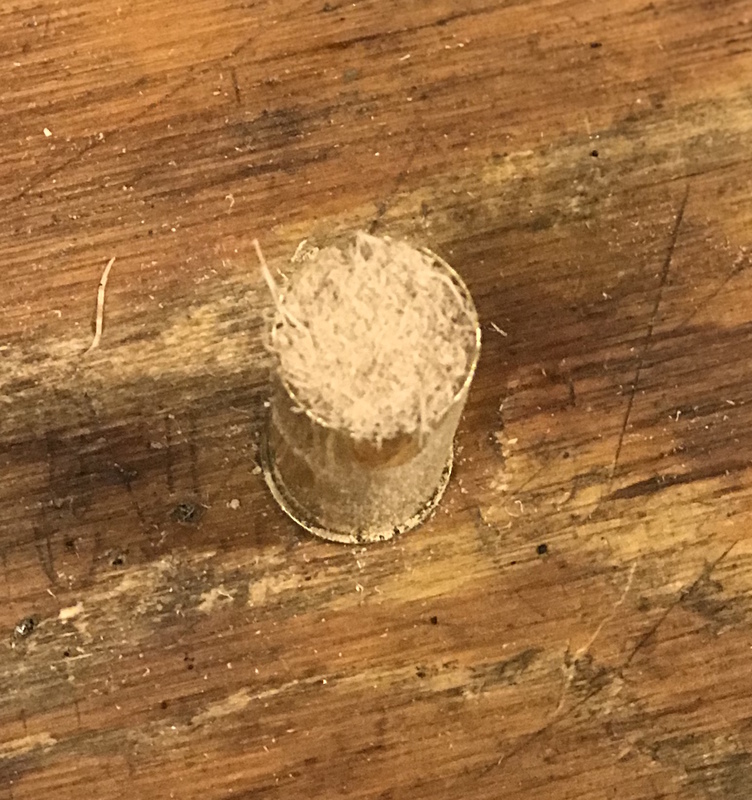 #5 shot with sawdust. 1-1/4 oz. #5 shot with felt wad. All shot loads were primed with Federal No.150 large pistol primers and charged with 80 grains of FFFg Goex black powder, and a home made cardboard over powder wad. 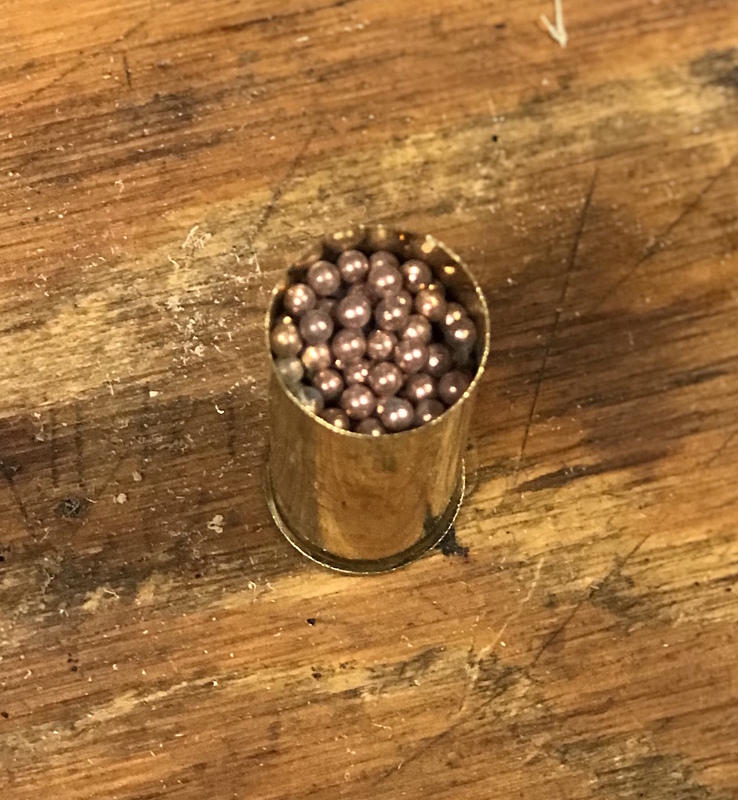 The round balls have two over powder cards, a lubricated felt wad, and a lubricated 0.020" patch, and 90 grains of FFFg. All shot loads are sealed in place using one of the BPI 10 gauge over shot cards held in place with silicone RTV sealant. I used Gorilla Glue gel super glue for the ball loads because I ran out of RTV. The 3/4" oak dowel I used for seating components. I drilled a hole in one end to fit over the primer pocket that protrudes into the case. Yes, the Magtech hulls are balloon head cases. 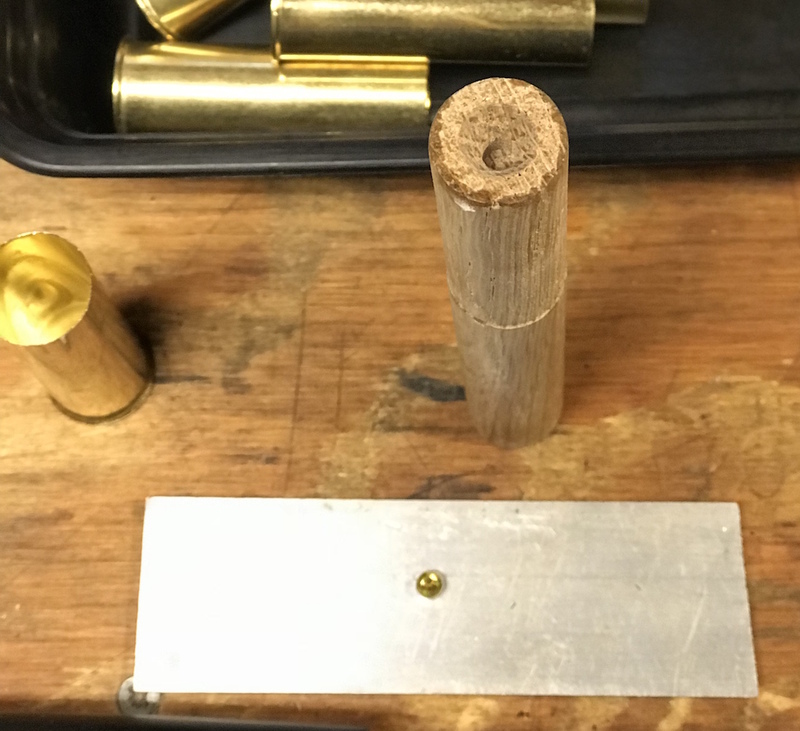 I used my lathe to slightly turn down the dowel so it would go all the way into the case, and to drill the hole. Some cases waiting to be primed, a case with the dowel inserted, and a primer sitting on a 1/8" piece of aluminum. To prime the cases, I placed the primer down on the aluminum, centered the case with the dowel in it over the primer, and gave it a few good whacks to press the case down over the primer. If this makes you cringe, consider that it is exactly how you prime cases in a Lee Loader. Make sure the primers are seated flush with the case head. You don't want to accidentally set off a high primer by closing your shotgun. Next up I poured a powder charge into the case and topped it with a card. For the sawdust shells, I then filled each case to the top with sawdust. I have a No.10 can filled with it that I've been saving to make fire starters. Then I used the flat end of the dowel to compress the sawdust. This was topped with another card and then the load of shot poured in. By using the drilled end of the dowel I was able to keep the sprue centered, facing up. Advantages of this method include that you don't need any tools you can't find or make at home, and the shells should be reloadable pretty much indefinitely, especially since the case mouths aren't being crimped. Because I'm using black powder, small variations in powder charge aren't dangerous the way they would be with smokeless powder, especially when shooting them through nitro-proofed shotguns. 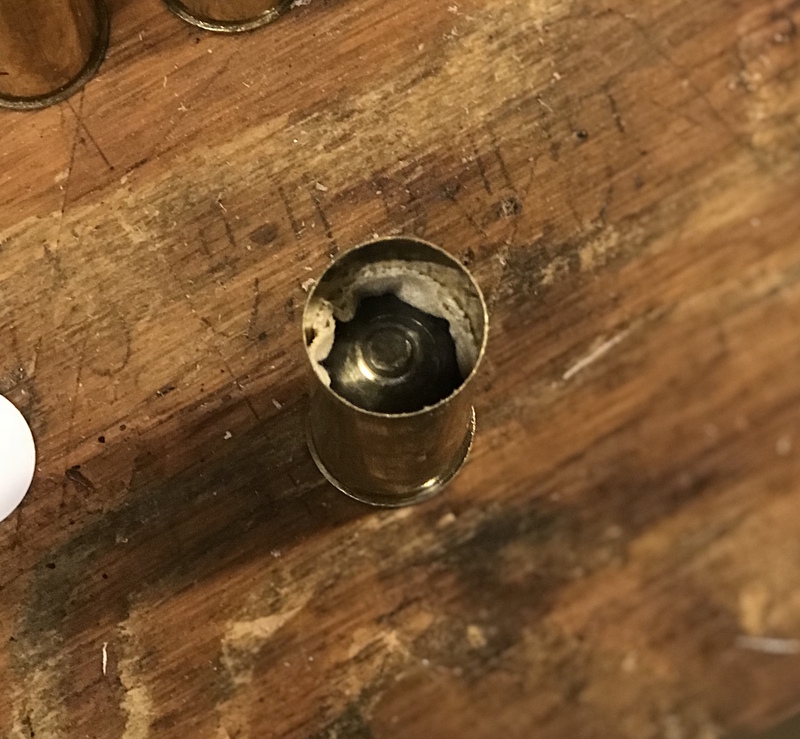 The main downside compared with loading shotshells with modern components is inferior performance. Modern shotcup wads that protect the shot from deformation in the bore result in better, more even patterns. Special safety note about the round balls: Before Foster slugs became widely available in the 1930s, "pumpkin balls" were the most common type of single projectile load in shotgun ammo in the US. After the introduction of choke barrels, they were generally loaded with balls significantly under bore size so that if they were fired through a choked barrel, the barrel would not be damaged. They don't compress as easily as Foster slugs. For this reason, I would not fire a patched .690 ball through anything tighter than improved cylinder. For example, I have an H&R Model 1905 made sometime between 1906 and 1915 with the barrel marked "12 GUAGE CHOKED." I measured the muzzle last night with calipers and it came out at about .695, which is extra-full, or even a turkey choke. I'll shoot the balls through my chopped, cylinder bore H&R Topper. Hopefully, I'll get to try out these loads in the next few weeks, and will post a follow up. 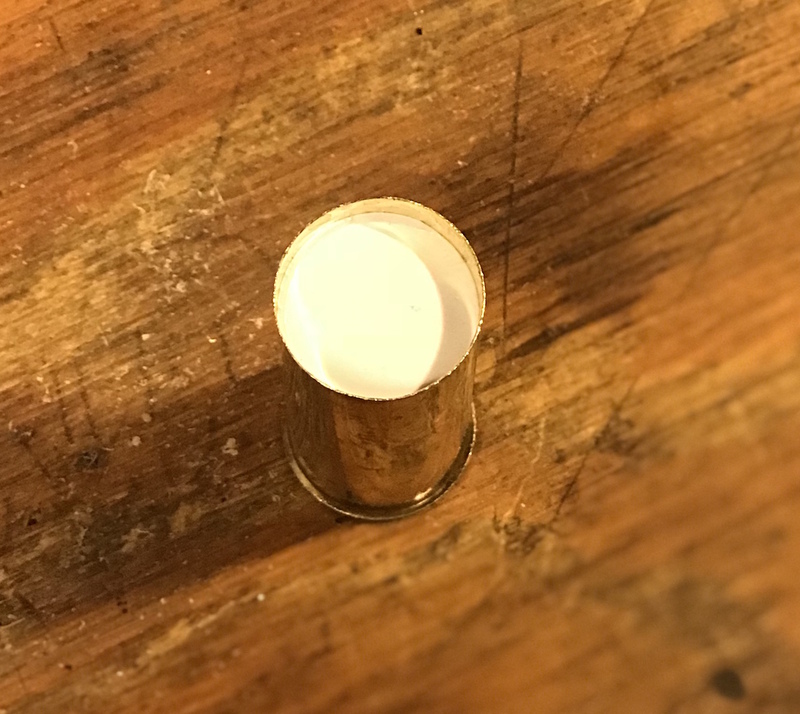 *Hot glue slug: A field-expedient slug which you cut the crimp off a bird shot load, pour out the shot, then add the shot back after mixing it with hot glue. When the glue hardens you have a slug that's useful at short range. Very similar to wax slugs. Do a lot of research before you make and shoot any, so you don't do anything dangerous.